Whether you are in the mood for traveling or planning a romantic trip with your loved one, Arizona has a place for you to explore. From cozy lodges for a relaxing trip, to national parks for a more physically-rigorous adventure, to a classic rodeo, these 10 perfect Arizona getaways must be experienced. At a pinnacle of the 12,633-foot summit, Humphrey’s Peak leaves you speechless with its premium viewpoints. To begin the ascent, make your way to the Agassiz Ski Lift. You can get a bird’s eye view of the entire North Rim of the Grand Canyon. Take a while and admire one of the largest and most beautiful man-made lakes in all of America. The entire area is covered with sandstone canyons to offer a spectacular view. 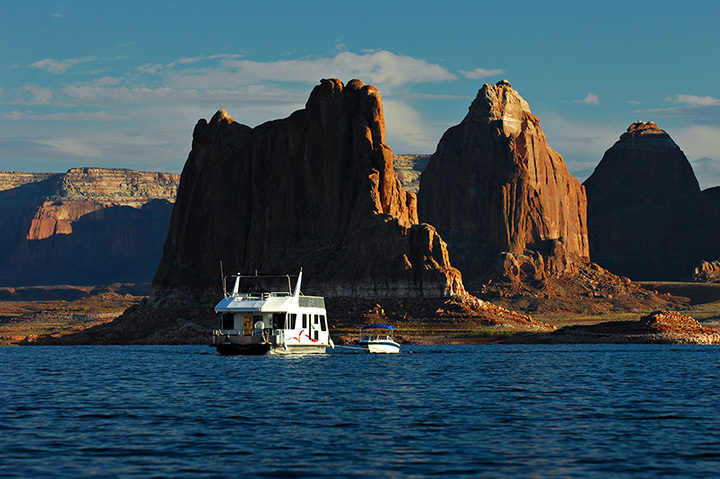 Check in at the Rainbow Room over at Lake Powell resorts to experience the nearby delights. If you fancy a relaxing afternoon massage with a rustic setting over at Arizona, this is the place to be at. Popular activities involve hiking and fishing at the Oak Creek Lodge. Experience how apples turn to cider near the organic orchards around. If you love ghost towns paired with Wild West vibes, then Fairbanks may just be the right place to head out. Filled with cottonwoods, mills, and cemeteries, the town gives a creepy atmosphere for adventurers. Hiking is best done during winters. A trip down nostalgia lane—if you ever wanted to experience Hanna Barbara’s famous cartoon, then take a tour through the theme-park of the Flintstones. With whacky volcanoes and dinosaurs, this is an outing you won’t forget. The Deer Farm is filled with antelopes, reindeer, bucks, and of course, as the name states–deer! You will also find a variety of other beasts such as wallabies, turkeys, llamas, and peacocks. A fee is required to enter the farm. The 92,000-acre park is filled with pines, firs, and aspen trees and is set in a two-part location. One part covers the entire Tucson Mountain District to the west and on the east, you can find the Rincon Mountain District. Activities such as riding broncos, barrel racing, parades, old western themed stands, etc. are the major attraction at this rodeo. Spend a day hanging out with real cowboys and cowgirls while experiencing the ways of the Wild West in the world’s oldest rodeo. If you want to tickle the science geek in you, this is the place to visit. With five ecosystems within its area including wetlands, rainforest, grasslands, coral reef, and fog desert, you can get a firsthand experience of the work that goes into the various biospheres. The place for horror fans and an entire procession dedicated after the famous horror movie–Day of the Dead. You can find guests in scary costumes, life-sized puppets, performers on stilts, and so forth. A special performance is also played out during the end which involves aerial stunts and obscure messages on urns.